Go to ‘Start’ menu and open the ‘Exchange Management Shell.’ In the Shell, type the below command to get the ‘Exchange Server.’ In the shell, type the following command to verify whether auditing is enabled on a mailbox. If Audit is enabled, you will get a true value. Under AuditAdmin and Audit Delegate, you will get all the functions the mailbox can perform. Here, you will get information on logon details, start and end audit date, and recipients mail address on which you will receive mail. An Administrator can also view the audit log for mailbox access in the Exchange Administrative Center. The above method requires a sound knowledge of Exchange Management Shell. It can also be time-consuming and complex to perform. Using the native method may also be too reactive, meaning you could miss the chance to prevent a security breach before it spirals out of control. Administrators also have to create the audit entries manually for an audit report, which can be time consuming. Auditing non-owner mailbox access is a vital aspect of ensuring your mailboxes remain safe and secure. 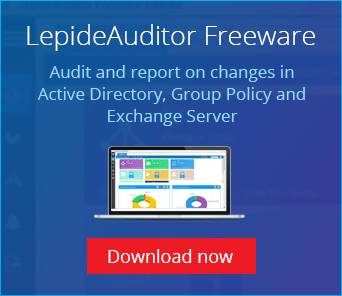 In order to truly ensure that you know what is happening within your Exchange Server, it may be wise to deploy a proactive solution like LepideAuditor for Exchange. Following report shows all non-owner accesses made to a user mailbox. 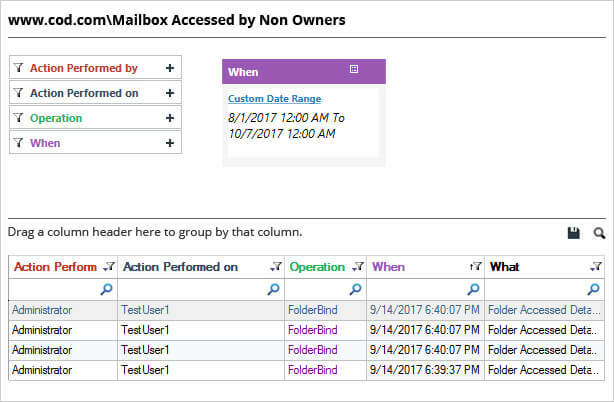 The above report gives details of who accessed a mailbox (user or a group), when and from where. You get all these details in one single record.